Prometheus (2012): Dir. Ridley Scott. Written by Jon Spaihts and Damon Lindelof. Based on characters created by Dan O’Bannon and Ronald Shusett. Starring: Noomi Rapace, Logan Marshall-Green, Michael Fassbender, Charlize Theron, Idris Elba, and Guy Pearce. Rated R for sci-fi violence including some intense images and brief language. Running time: 124 minutes. In many respects, Prometheus is Alien’s bigger, louder, and less intelligent cousin. It’s the latest film from director Ridley Scott, returning to the Alien franchise for the first time since the original film debuted. Scott has claimed that his new film is not a prequel—though I suspect fans might have something to say about that. 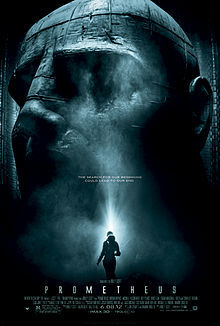 Comparing Prometheus to 1979 horror classic might seem unfair, but why so? The new film takes place in the same universe and has the same director. Consider also that Alien gets right what so many other horror films get wrong (including this one to some degree). But this version is at least one thing that the original was: it is positively riveting. Their quest is ambitious to say the least. Shaw and her husband have uncovered mysterious cave paintings across the globe that all share one thing in common: they depict a large sentient being pointing toward a specific constellation, no matter where the digs occur. This leads them to the conclusion that the beings depicted are the originators of life on Earth. How this conclusion comes about is anyone’s guess, as the film takes it pretty much for granted. I suppose the voyage wouldn’t be nearly as interesting, now would it? As we might well expect, all does not go according to plan (not that a concrete plan seems to exist anyway). Shaw has failed to account for the treachery of the moon itself and of her employers. As in Alien, Scott doesn’t bombard us with danger until we’re fully entrenched in the world of the film. He has a knack for building suspense and tension through atmosphere, aided by some impressive production design. We know something bad is going to happen, and the waiting is perhaps more fun than the payoff. The cast turns in strong performances from mostly underwritten characters. Scott allowed his actors in Alien to improvise their dialogue, allowing for a more natural feel. Here, the dialogue sounds more like a constant stream of plot points. Still, Noomi Rapace is convincing as the initially curious and then imperiled scientist. Michael Fassbender stands out as David, a space-age Pinocchio. (I’d argue he might be the most interesting android in the franchise yet.) His motives are never really clear—he possesses a childlike innocence that belies his adult appearance. This is just the latest of many impressive performances from Fassbender in recent years and one hopes he’s gained mainstream attention by now. Once danger arises (and it isn’t just one thing, either), the film settles into a good pace which conveys both the wonders and the dangers of the mysterious terrain. But the style of horror in this film marks a definite change. In Alien, it lurked almost strictly in shadowy crevasses and in our own minds. Alternatively, Prometheus goes for the jugular. Its brand of horror is perhaps closer to Cronenberg’s body-horror films than to a Gothic horror story. One sequence in particular involves a bloody and terrifying surgical operation which rivals the infamous chestburster sequence from the 1979 film. I can’t say much more than that, but I guarantee you’ll know when you see it. Aside from the blood-letting, the film does ask some interesting questions—its frequent juxtapositions of creation and destruction deeply infuse the visuals and design of the film. But the plot feels more aimed at generating thrills than at exploring any philosophical questions. Which is fine, because it’s one hell of a ride. I agree, this movie can’t touch Alien as a horror film. The “horror” scenes in Prometheus are more akin to how teenagers act in a Friday the 13th movie (also something I enjoy but obviously not on the same level) though the major exception here is the surgery scene which is just so damn cool (and you’re right, it gives the classic scene a run for its money). Yeah, the kills here feel kinda juvenile, don’t they? And they’re usually the result of sheer stupidity. Running away from a rolling ovular spacecraft IN A STRAIGHT LINE is one way to weed yourself from the gene pool.